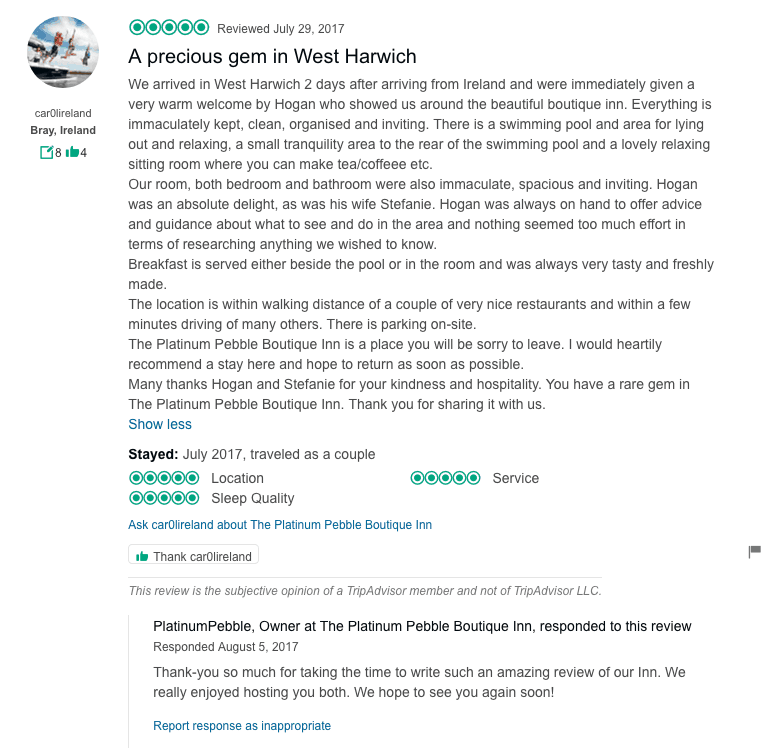 We arrived in West Harwich 2 days after arriving from Ireland and were immediately given a very warm welcome by Hogan who showed us around the beautiful boutique inn. Everything is immaculately kept, clean, organised and inviting. There is a swimming pool and area for lying out and relaxing, a small tranquility area to the rear of the swimming pool and a lovely relaxing sitting room where you can make tea/coffeee etc. Our room, both bedroom and bathroom were also immaculate, spacious and inviting. Hogan was an absolute delight, as was his wife Stefanie. Hogan was always on hand to offer advice and guidance about what to see and do in the area and nothing seemed too much effort in terms of researching anything we wished to know. Breakfast is served either beside the pool or in the room and was always very tasty and freshly made. The location is within walking distance of a couple of very nice restaurants and within a few minutes driving of many others. There is parking on-site. 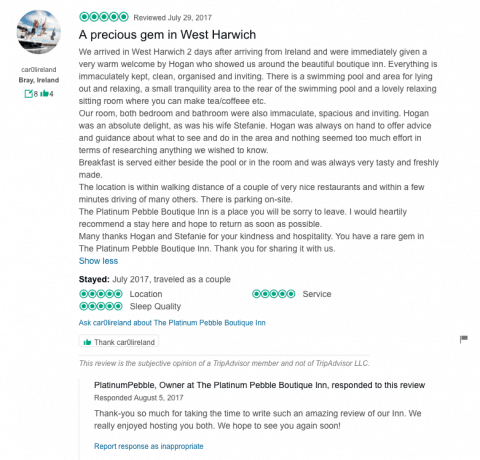 The Platinum Pebble Boutique Inn is a place you will be sorry to leave. I would heartily recommend a stay here and hope to return as soon as possible. Many thanks Hogan and Stefanie for your kindness and hospitality. You have a rare gem in The Platinum Pebble Boutique Inn. Thank you for sharing it with us.